In most cases, it would be safe to assume that spending $370 million in a summer will land you a good deal of talent. It would also normally be safe to assume that you could build a pretty solid starting eleven from scratch with that kind of money. As a matter of fact, it wouldn’t be insane to think that this starting eleven would be good enough to compete at a high level in any of the world’s top leagues. And if you already had a nice contingent of world class talent in your side, well it would also probably be safe to assume that the newly constructed squad would be world beaters. But this is Real Madrid we’re talking about; so let’s just throw all of the “safe assumptions” out the window. i'm not convinced that pepe's torn ACL is really the hammer blow everyone's making it out to be. Look, it’s going to be awfully hard for me to argue that the purchases that Real pulled off this summer were bad. Any team in the world — and I mean any — would be wetting themselves over the prospect of landing one of Kaká, Ronaldo, Alonso or Benzema. Shoot, their other “smaller” signings (Raúl Abiol, Arbeloa, Garay & Granero) this summer would also be coups for most sides in the world. Considering los Merengues already had the likes of Raúl, Sergio Ramos, van Nistelrooy, Pepe and Casillas in addition to these new players, at least on paper they looked like world beaters. If only it were that easy. As is almost always the case with Madrid’s spending sprees, a majority of the money ends up lumped at the offensive end of the pitch. And while attacking talent is fun to watch (and what the club and fans desire), it’s not hard to see that squads with proper defenses usually end up with all of the silverware. And for their part, Florentino Perez and the rest of the Madrid front office did make some efforts to bolster the club’s notoriously porous defense. Despite not being a backline player, Alonso was actually the best signing they made all summer as he’s fantastic at cutting out passing lanes (not to mention his superb distribution skills, too). Raúl Abiol was a solid signing to replace the exiting geezer Cannavaro. And the young Argentine, Garay, is also a promising purchase for the future. However, the signing of right back Álvaro Arbeloa is puzzling, since they already had Sergio Ramos. If they’re to get their money’s worth out of him, he’ll have to play on the left where he’s not near as effective. Looking at the season so far, they’ve only conceded 13 goals in 14 La Liga outings. Not too shabby, until you look a bit closer. They’ll go a few games without giving up a goal, then they’ll give up two per game to the likes of basement dwellers like Valladolid, Deportivo la Coruña and Atlético Madrid. And that’s not even including the 0-4 drubbing by pub side Alcorcon in the Copa del Rey. While I can somewhat understand giving up 2+ to the likes of Sevilla, Valencia, and A.C. Milan, continuously allowing multiple goals to top tier sides is eventually going to catch up with you. So when Pepe sustaining a torn ACL in last weekend’s win at Valencia, everyone began predicting that worst for Madrid. I’ve been thinking about this for a while now, and to be honest, I’m not really sure why everyone is so distraught. The more i think about it, those two tweets say a lot about Madrid’s defensive shortcomings. The Portuguese center back, who made a $43 million move from Porto in 2007, was brought in to a ton of fanfare. Pepe was on the path to develop into a world class defender, one that could eventually be on par with Cannavaro and who would solve Madrid’s woes in the back. At least those are normal expectations for someone who cost so much. Keep in mind that Los Blancos play a very aggressive style of football, pushing forward from nearly every position on the field. In particular, they’ve always had attacking wing backs who spend as much time attacking as they do defending. How many times have you seen Sergio Ramos making an overlapping run all the way up to the opposing penalty area? Hundreds would be an understatement. Arbeloa and Marcelo do the same on the left. All of that is fine when you have center backs who tend to stay at home. Problem is, Pepe doesn’t always do that. Since Real’s aggressive, attacking style leaves them vulnerable to counter attacks, Pepe’s habit of pushing forward often leads to Abiol and a wing back having to deal with the rush on their own. Going forward from central defense is okay from time to time — think John Terry (God, was that hard to type) — but more restraint is necessary than what Pepe often displays. So personally, I feel their biggest problem isn’t having Pepe injured. Real’s biggest problem is Pepe. Luckily, the Portuguese’s recent injury may provide them with a unique opportunity to see if they can improve without him and prove me right. That’s not to say that i’m happy he is injured — I definitely wish him a speedy recovery — but i think this could be a good thing for Madrid. Who of any quality is going to be available? I’ve read that they’re interested in signing Ricardo Carvalho from Chelsea, but there is no possible way that London outfit will let him go considering their current spot in the title race. None of the other top sides are going to be willing to sacrifice a world class defenders either, at least without holding Madrid hostage for more money. Even if they buy someone new, it will take more time to integrate him into the squad. With that being one of the main issues the team has had so far this season, why would the club want to go through all of that again, when the team is just beginning to come together?! Long story short, they need to quit spending to solve their problems.l Let’s give the people already on the books a chance. 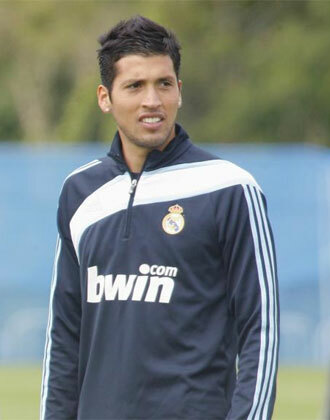 Particularly, I’d really like to see Ezequiel Garay get the opportunity to fill in. The tall Argentinian gained a boatload of confidence and experience on his loan to Racing Santander last year, and he played out of his mind against Valencia once he replaced the injured Pepe. It also seems that the gaffer has a lot of faith in him, and seems to prefer using Garay instead of signing someone new. But, whether or not Pelligrini can convince Perez and Valdano to stay out of the transfer market is another question all together. Either way, it will be very interesting to see how Real deal with their new Pepe problem. With barcelona seemingly hitting their full stride as of late, they don’t have much time to figure out a solution. Otherwise, it will be safe to assume that their $370 million spending spree was for a whole lot of nothing.